Production: Toho, in association with Kurosawa Films; black and white, Tohoscope; running time: 110 minutes. Executive producers: Tomoyuki Tanaka, Ryuzo Kikushima; screenplay: Ryuzo Kikushima, Akira Kurosawa; photography: Kazuo Miyagawa; art director: Yoshiro Mikami; lighting: Choshiro Ishii; music: Masaru Sato; sound: Hisashi Shimonaga. Cast: Toshiro Mifune ( Sanjuro Kuwabatake ); Eijiro Tono ( Gonji ); Seizaburo Kawazu ( Seibei ); Isuzu Yamada ( Orin ); Hiroshi Tachikawa ( Yoichiro ); Susumu Fukita ( Honma ); Kyu Sazanka ( Ushitora ); Daisuke Kato ( Inokichi ); Tatsuya Nakadai ( Unosuke ); Kamatari Fujiwara ( Tazaemon ); Takashi Shimura ( Tokuemon ); Atushi Watanabe ( Coffin maker ). Kael, Pauline, I Lost it at the Movies , New York, 1965. Richie, Donald, The Films of Akira Kurosawa , Berkeley, 1970. Richie, Donald, Japanese Cinema , New York, 1971, 1996. Burch, N., To the Distant Observer: Form and Meaning in the Japanese Cinema , 1979. Desser, D., The Samourai Films of Akira Kurosawa , 1983. Buehrer, Beverly Bare, Japanese Films , London 1990. Prince, Stephen, The Warrior's Camera: The Cinema of Akira Kurosawa , Princeton, 1991; revised and expanded edition, 1999. Yoshimoto, Mitsuhiro, Kurosawa: Film Studies and Japanese Cinema , Durham, 2000. Variety (New York), 30 August 1961. Gillett, J., Monthly Film Bulletin (London), July 1970. Gow, G., Films and Filming (London), August 1970. McDonald, Keiko I., "Swordsmanship and Gamesmanship: Kurosawa's historical milieu in Yojimbo, " in Literature/Film Quarterly (Salisbury, Maryland), no. 3, 1980. Peary, Gerald, in American Film , vol. 14, no. 6, April 1989. Tesson, C., "L'homme enrage," in Cahiers du Cinéma (Paris), no. 440, February 1991. Carty, Brad, in Wilson Library Bulletin , vol. 67, no. 4, December 1992. Felperin, Leslie, "John Sayles Walking Alone," in Sight & Sound (London), vol. 6, no. 9, September 1996. Charity, Tom, "Hill's Angel," in Time Out (London), no. 1362, 24 September 1996. Boxoffice (Chicago), vol. 132, September 1996. Filipski, Kevin, "Return of the Samurai: Two Akira Kurosawa Originals," in The New York Times , AR30, 24 October 1999. Yojimbo is possibly Akira Kurosawa's best-known film in the West, a samurai sword-fighting movie that, though entirely Japanese, still resonates nicely for Americans used to their own period gunfighting film genre, the western, the "grammar" of which Kurosawa learned from John Ford, just as Sergio Leone and Clint Eastwood in turn learned from Yojimbo . As is typical of much of Kurosawa's canon, Yojimbo involves ironies and tensions in its use of its genre, a mark of this great filmmaker's innovative approach to conventional materials. Here, the central figure of the samurai, involved with the town and yet distant from it, becomes a metaphor for anyone torn between active opposition to evil and the far safer course of staying on the sidelines. According to Donald Ritchie in The Films of Akira Kurosawa (1970), Kurosawa consciously set out to deal with the problem of choice when "both sides are equally bad." Toshiro Mifune plays Sanjuro Kawabatake, a ronin , a masterless samurai who happens on a dreary small town evenly divided between a silk merchant and a sake merchant, Tazaemon and Tokuemon. As their echoing names suggest, there is little from which to choose between these two worthies, the feud having reached the point at which hope for sensible compromise has been overwhelmed by mindless hatred. It is 1860, and in his wanderings as an unattached ronin Sanjuro has seen this pattern repeated all too often as the old social order of the Tokugawa Shogunate has broken down and the feuding upstarts of the merchant class have taken over. He plays the two sides against each other, first hiring out as yojimbo or bodyguard to the silk merchant, then switching sides when the sake merchant's younger brother Urosuke appears with the only firearm in the district, a revolver. However, Sanjuro's bedrock sympathy is for the few beleaguered innocent citizens caught up in the chaos of conflict. Gonji (Eijiro Tono), a humble saki seller with whom Sanjuro stays, reflects the basic decency and outrage of the city's ordinary citizenry, who have helplessly watched their town being taken over by ruffians and their neighbours greedily seeking to profit from it (like the busy coffin maker next door), but who bravely dare to further Sanjuro's efforts. Sanjuro, competent, sure, cynical and worldwise, is set against Unosuke, a ruthless, cruel, and ambitious sadist who places his trust in a weapon from the West, a technological trump card; ultimately Sanjuro brings him down with a humble villager's knife. Sanjuro's involvement with one side and the other is both whimsical and practical: it is a way of passing time while amusing himself and earning a bowl of rice. Throughout, there is a comic counterpoint between Mifune's patented samurai swagger and the small humanizing touches he brings to the role: his shrugs, scratches, chin-rubs, and grunts, his chewed-on toothpick. For the two camps in the village, only total victory will serve; for Sanjuro, victory is surviving another day and moving on in his journey. He cleverly manipulates the hatreds and hopes of both sides but is almost undone by a simple act of human kindness. After he slaughters the jailers of a poor farmer's enslaved wife, who was abducted by the sake dealer's party, Sanjuro threatens to kill his protégés if they are too grateful ("Shut up—I hate grateful people"), and, ironically, their intercepted letter of thanks brings Sanjuro an horrific beating. Ultimately, however, he overcomes near impossible adversity and odds to kill all the combatants; arms and innards fly when with masterful swordsmanship Sanjuro demonstrates the difference between skilled samurai and hired thug. At the end, like Shane, Yojimbo leaves the town to its own devices, peaceful but decimated, its silk burned, its sake spilled: "Now it will be quiet in this town." Several elements raise this story above its tawdry characters and plot into a profound commentary on human passion, greed, and folly. Mifune's Sanjuro is a brilliant character, a supremely confident samurai übermensch who figuratively and literally looks down on the grovelling and bickering villagers. He is above them morally because, in ways that encompass both Zen and existential thought, he understands the meaninglessness of material gain and the total folly of their grasping for temporal advantage. Two early scenes establish the vanity of human wishes and Sanjuro's submission to the unseen forces that rule us: in one, a dog trots happily down the village street, a human hand in his mouth; in another, Sanjuro chooses his direction by throwing a stick in the air at a crossroads. In a dog-eat-man world, only fools squabble over who owns the gutters. Also, Yojimbo is a model of efficient cinematic storytelling. The filmic exposition captures visually the claustrophobic closeness of village life and the local reign of terror as Sanjuro eats rice and observes the plotting of the sake lord out of one window and that of the silk lord out of another. Later, the camera-eye is that of the battered Sanjuro, inside a coffin, watching with approval the bloodletting his shifting allegiance has precipitated. 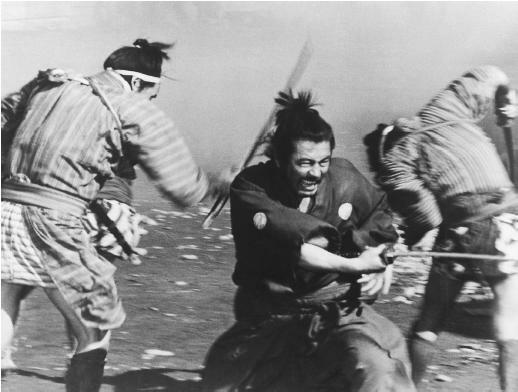 Miyagawa's telephoto lenses visually compact and intensify the sword-fighting scenes: the disorganized bloodlust of cowardly bullies versus the cool efficiency of the samurai. Symmetrical framing, shots at right angles, carefully orchestrated ballet-like action, and inspired synchronizing of music and movement make for an artistically stylized whole, not quite Kabuki, but mythic in resonance. As Ritchie points out, the combination of a "cheerfully anarchistic philosophy . . . presented with a stylistic unity" results in a satisfying whole. Ultimately, Yojimbo glorifies the individual who is willing to take on organized monopolies. Its black humour, bleak realism, and brutal violence are offset by the image of a lone individual, competent, aloof, who sympathizes with the ordinary townsfolk, restores order and rights wrong at heavy cost, and then moves on.